I later realized that if I had mixed the grout with a little water first I could then mix it into the paint with no lumps! I got the look I wanted and the lumps brushed out. I don't know if the primer in the paint alone would have worked, but the paint adhered very well to the shiny surface and no more lumps. I changed the hardware and painted the inside too! 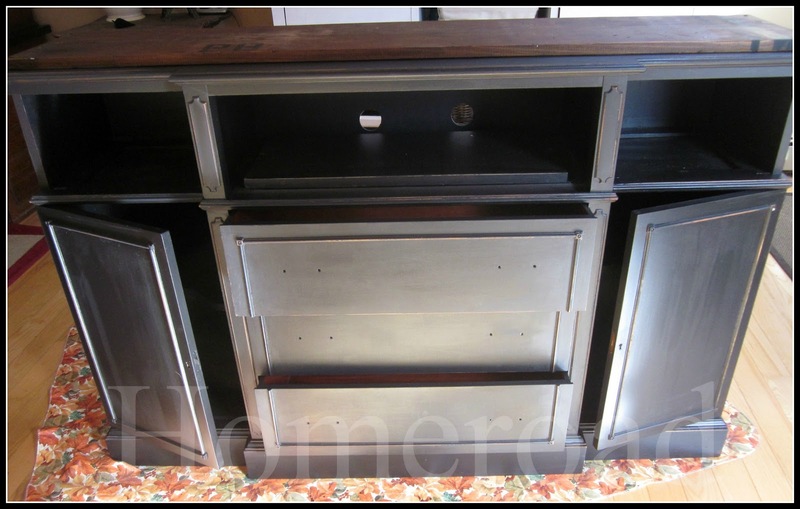 china cabinet base, this is exactly what I wanted! It goes with my decor, it matches my armoire table, and I'm going to have to try hard to watch TV now and not just stare at the beautiful new TV stand! I'm so glad you posted your experience with black chalk paint. It is fantastic! It was already a marvelous piece and now it's even better. Love it. What a beautiful piece! I just posted my own first chalk paint project, check it out!! 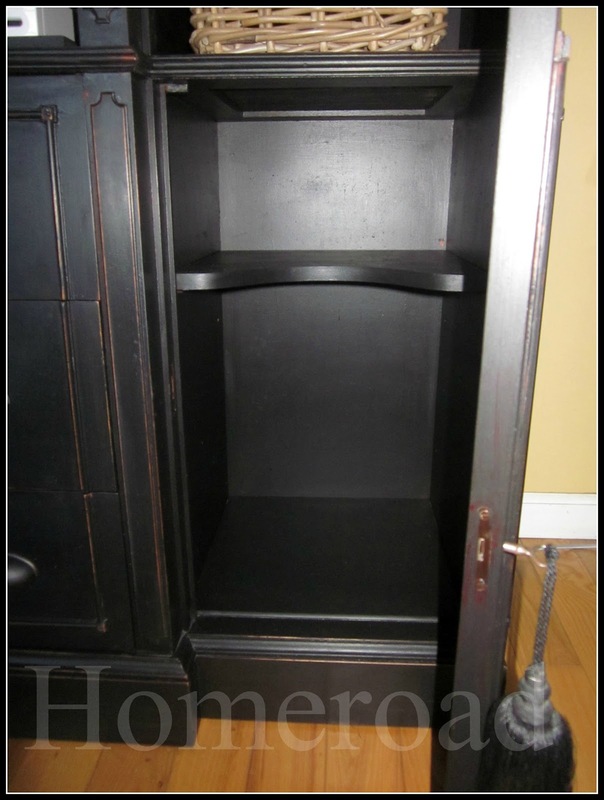 Love, love, love this cabinet!!! It is just plain gorgeous Susan! I love the black. I would like to try the real ASCP but for me to get a quart of paint, it would cost $52.45 (49.95 + tax) plus an hours drive. Yikes! Think I will stay with the homemade brand. Well, I think you could admire it during commercials, Susan! : ) I think it turned out great! It looks like it works perfectly for you here and I really love the way it turned out. You would never know it looked like that before picture. Great job! WOW! Totally different look. I like the PB stenciled on the top. BEAUTIFUL! on the hommade chalk paint. I definately am going to try this. Love the black color with the sanded edges also. That piece is absolutely gorgeous! I have been dying to try homemade chalk paint and this is motivating me to do it. What type of paint did you use (flat, satin)? How much water would you recommend mixing with the grout before adding to the paint? I wish I could reply to you directly but your settings are on "no reply" so you can not be reached. I used satin Home Depot paint with primer... I really don't think the primer made a difference. I would use less than 1/4 cup of water to mix the grout into the quart of paint. Good luck, let me know how it turns out! Your TV cabinet turned out great ! Love it ! You asked me what kind of wood I used on my table , It was one of the better grades of pine from Home Depot , the legs are made from 4"x4"s that are not treated . I priced out premade legs and they were just to high priced for me . I'm glad you liked it . Thanks for visiting . Good luck with yours , I'm sure you can do it . The cabinet is gorgeous! So hard to believe it's the same piece!! Thanks for the info. on the grout.....those are the tips that come in handy! 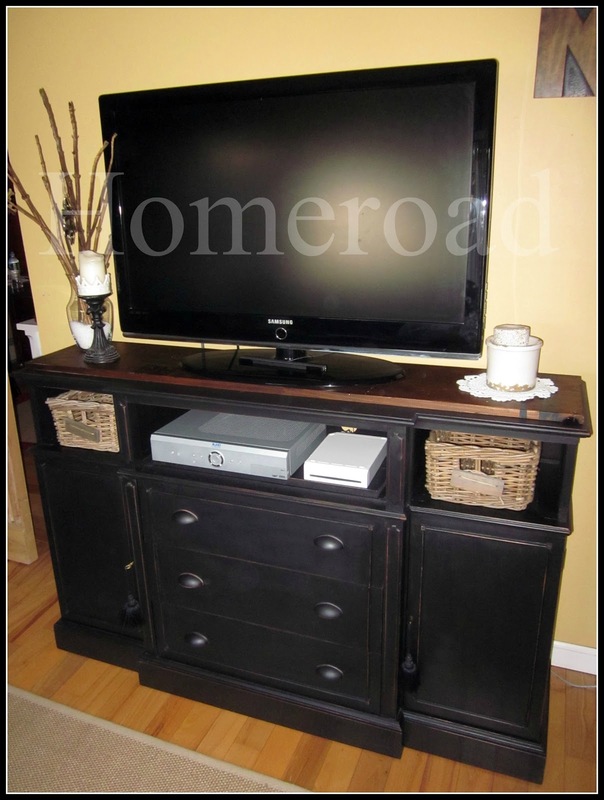 love the tv stand, it's perfect, great job! Hi Susan - It looks GREAT! Mixing the paint seems kind of like making gravy. You don't want the lumps!!! :) I've heard of making it with Plaster of Paris too. I wonder how that would work? I'm going to have to try this. SUSAN, It looks AMAZING!! I love how it turned out!!! It looks so professional and perfect! Great Job! 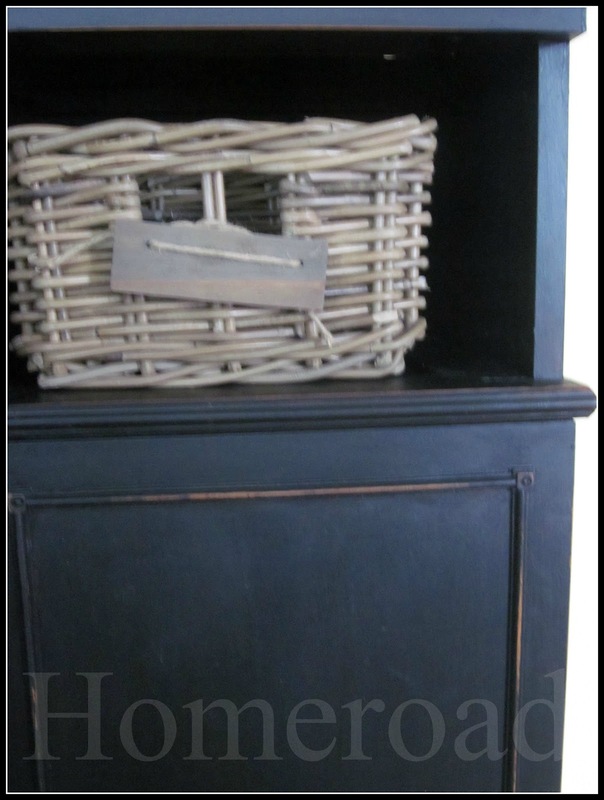 I just love how your TV cabinet turned out and the fact that you made your own chalk paint..fabulous! Wow, what a great piece and repurpose as a TV stand. I love black painted furniture and your piece has such a great shape. I'm glad you figured out the mixing with water part first, I was going to suggest that. I made my first chalk paint this week and the instructions I found from Elizabeth and Co. said to mix the plaster of paris with water first. Turned out great. Thanks for sharing. It turned out beautifully. This is beautiful! I have to say thought I tried the chalk paint recipe with the grout on small projects and didn't like it. I don't like the little bumps from the grout. I just found you googling homemade chalk paint! I am so excited to have found your blog. 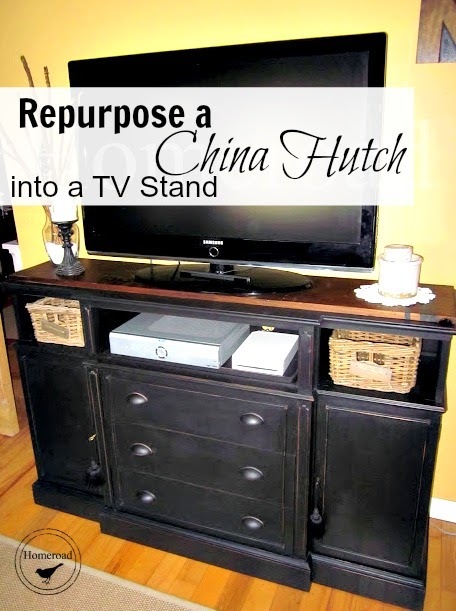 Your china cabinet/tv stand is beautiful!!! Thanks for this post. I almost bought the grout today, but then got scared. Now that I have seen your post I'll go pick up that grout that I almost got today!!! 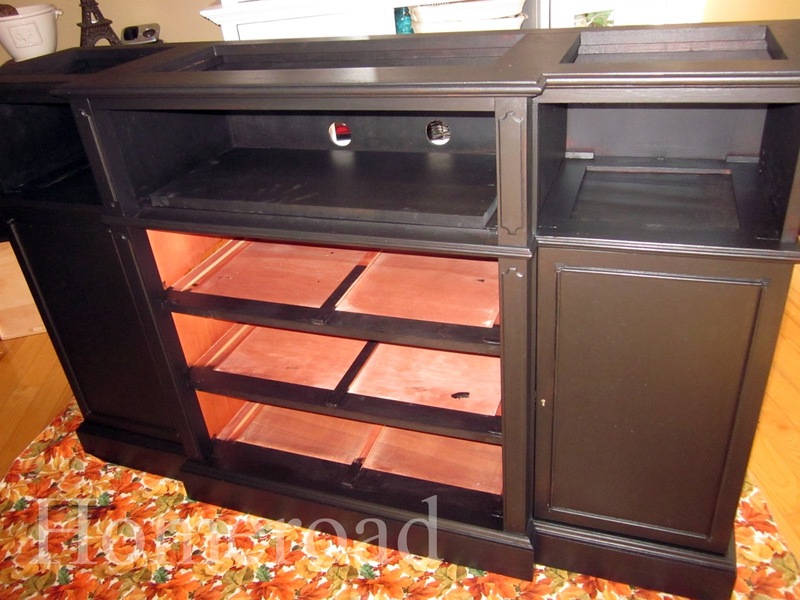 Oh my gosh, it's hard to believe that is the same piece of furniture! 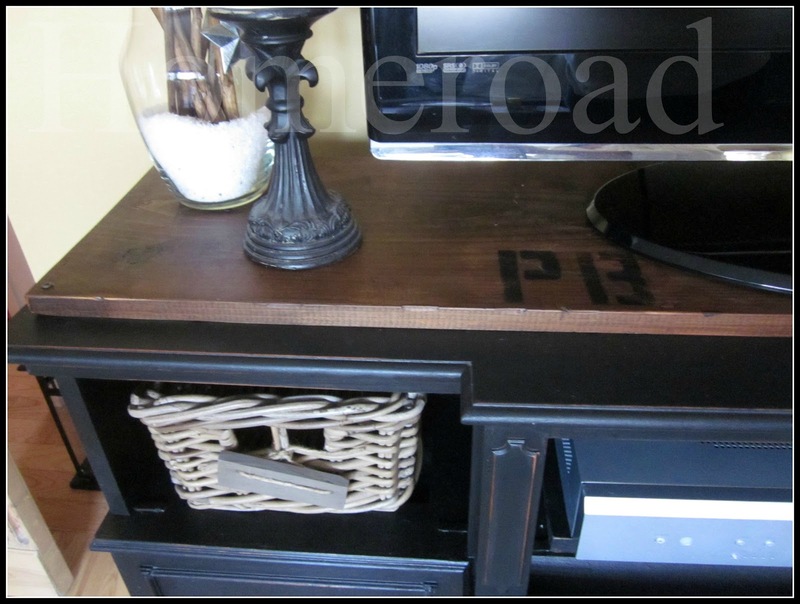 your tv stand turned out really pretty! 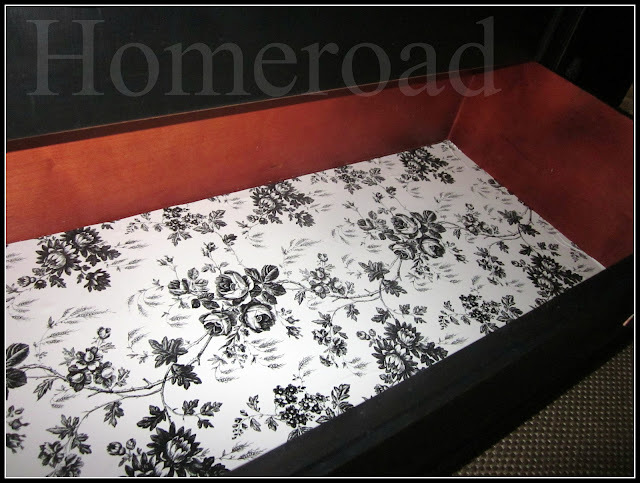 I made homemade chalk paint (black) with plaster of paris, and I liked it. I have also made chalkboard paint with the unsanded grout, and I liked it also. LOVE IT!!! One of the best revamps I've seen in a while! It looks wonderful. I especially love the drawer liner ;) It's super cute!! Where did you find the drawer liner? Love it!